Again issued through the Topps online store, 2018 Topps Allen & Ginter X Baseball is essentially an exclusive parallel set of the main A&G release, but done in a more basic format. Keeping to tradition, the 2018 Topps Allen & Ginter X Baseball checklist features the cards from 2018 Topps Allen & Ginter Baseball, but with base and mini cards using a black design. There are also exclusive Red and Silver mini parallels. Shop 2018 Allen & Ginter X boxes direct from Topps. In addition, the Framed Mini Autographs set features over 100 baseball and non-baseball signers, also done in black. 2018 Topps Allen & Ginter X Baseball does not have all the A&G signers from the main product, but it does have most of them. These signed versions come one per box. Past years of Ginter X, including 2017, have been very popular with collectors. 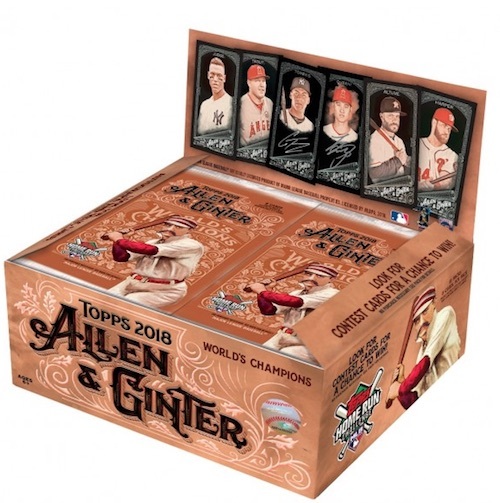 Buy 2018 Allen & Ginter X boxes direct from Topps for $70. PARALLEL CARDS: Black Mini, Red Mini, Silver Mini. 105 cards. 1 per box. See the 2018 Topps Allen & Ginter X Baseball checklist spreadsheet. Yep, it usually doesn’t last long. Topps has put these out for several years now. I bought 4 boxes and pulled 6 autos – all /25. If I had known that ahead of time I would have bought a few more. Incredible value for the price. 2018 Topps Allen & Ginter X 1 SEALED HOBBY BOX Online Exclusive Cryptocurrency? 2018 Topps Allen & Ginter X - 1 HOBBY BOX (Ohtani RC Autos?) Online Exclusive!